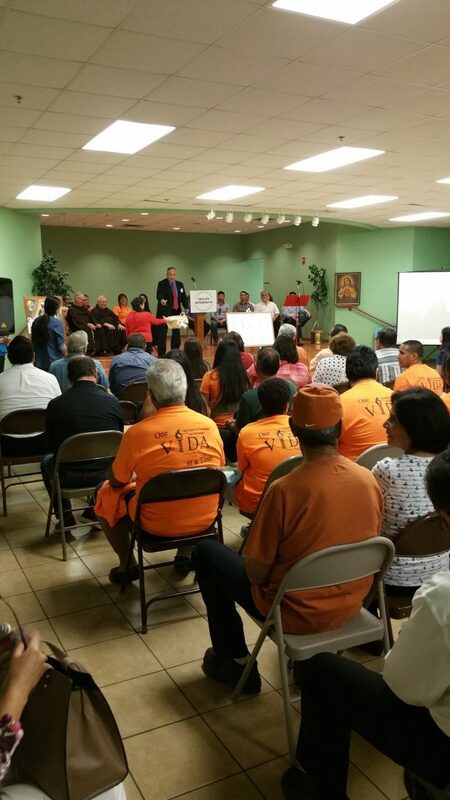 Edinburg residents listen as eight different candidates answer questions posed by Valley Interfaith on Sunday in Edinburg. EDINBURG — Mayoral candidates Richard Molina and Gina Alamia share at least two things in common: they refused to pledge a donation of more than $440,000 to a local nonprofit and they think it’s time for Edinburg Mayor Richard Garcia to say goodbye to his post. All but one of the eight candidates running for office in November attended a forum Sunday afternoon at Holy Family Church in Edinburg, where more than 150 people gathered to hear where they stood on at least three issues. Representatives from Valley Interfaith, the local nonprofit that hosted the event, asked each candidate to address three of their concerns. Two of them focused on the immediate needs of the parish and nearby residents — including a need for drainage improvements and the addition of speed bumps — while the third focused on funding for a local nonprofit: the Valley Initiative for Development and Advancement (VIDA). Better known for its acronym, VIDA provides highly-skilled training and educational opportunities for in-demand industries to residents in need. But the program, affiliated with Garcia’s wife, has become a major point of contention between the two political factions on the council. Tensions between the two parties — coupled with the mayor’s conflict of interest in the matter — have led to the defunding of the nonprofit that once saw hefty donations from Edinburg. Since its defunding last year, the nonprofit has staged several protests at city council meetings, where students and alumni have professed their achievements and have implored city leaders to restore the nonprofit’s funding. Sunday’s event included a similar approach, with two women sharing their stories of personal and professional growth. One is about to graduate with a degree in business management in December, while the other works as a registered nurse, earning more than $70,000 a year. The nurse said she is now a homeowner in Edinburg and no longer needs government assistance. After their presentations, each candidate was asked for $442,000 in funding over the next two years. Garcia, however, has previously recused himself from any action involving the nonprofit because of his wife’s connection to the program. It is unclear if that affiliation continues to date. When Alamia took to the podium and responded “absolutely not” to funding VIDA, a shocked audience gasped and a few attendees quietly booed. Alamia indicated she could not agree to award a contract because it would violate state law, a point Gilbert Enriquez, who is running for Place 2, also echoed when he was asked the same question and refused to commit to a specific amount. Instead, Enriquez said, VIDA should be evaluated and audited before any action is taken by city leaders. Molina, the sitting council member who has refused to approve funding for the nonprofit on several occasions, said he would agree to give VIDA $150,000 this year, but could not commit to $292,000 next year. His answer, however, did not satisfy organizers, who marked “no” on a white dry-erase board where they kept a tally of the candidates’ answers.